Hello...no, it's not Craft Day Wednesday, but Clarice and the television were victims of Tuesday night's storms and neither were up and running until today...I didn't miss the television, but I sure did miss Clarice. So, today will be a craft post, and a favs post later on. I finished the little blue denim-looking baby blanket for Christine's new baby boy. It is meant to be used in the car and just left in there...we had such when our boys were little and found them very handy as in summer the air conditioning would make their little bare legs cold and in winter it seemed like there was always a chill in the air. Anyway, it's all completed and ready to be shipped to St. Louis. I hope she likes it! On another front, my first quilting class was last Thursday night. We learned a lot from the introductory information, made our templates, chose our project, picked out and purchased the material for the project. Overload for me for sure...a lot in one two hour class. So this week our homework was that we needed to cut out the first block of our project with the templates we made and the material we purchased...today's assignment in the photo above. My first block only has two colors in it, so I didn't cut into the others yet. I wanted to just go ahead and cut them all out, but I was afraid that I might not be doing it exactly correctly (this seemed too easy in other words). I decided to go to class tonight and see how I did with this first one. It's a fun class with Katie and Suzanne in it also, so I am definitely looking forward to having a go at it again tonight. Oh, and the project for the class was a four block wall hanging, but I thought maybe I would enjoy something else a little more, so I am making a four block table runner with my blocks instead. I really love the idea of making useful things and when I am done, I can put it on the table and use it right away...how gratifying! The colors are (I am certain you will all be very surprised...NOT): Cranberry, Navy, Hunter Green, and Beige. 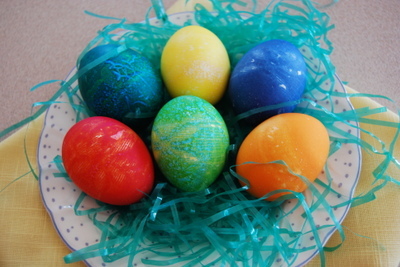 I know, I know...but those are the colors in my dining room, so lighten up with me being so uncreative and boring. I love them! 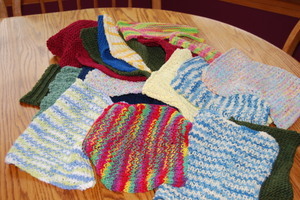 Twenty-One Dishcloths ready to be shipped out of here...enjoy! Four posts today (go ahead and scroll down and count! 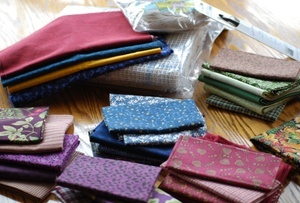 )...way too many, but it is craft day and I do need to post my crafting because I actually have some things to post! Craft day...first, result(s) from the Wonderfully Constructed Hand Knitted Dishcloth GKT Blog Giveaway drawing: you are all winners. Twenty-one people entered the drawing for one of these lovelies, and I couldn't bear to draw just one name for those of you being such good sports about this, when I know you all make wondrous things yourselves. Winners are: Meg, Susan, Hollie, Shelley, Katie B., Karen, Anne, Helen, Maggie, Kristina, Jan, Jane, Linda, Amanda, Carol, Theresa, Myra, Darcy, MK, Jill, and Melissa. Your dishcloth is on its way to you...enjoy...and thanks for the fun! In making the dishcloths, I learned ten new stitches, got to work with different kinds of yarns (all washable, of course), and loved having all the different colors flowing through my fingers. This week we are going to finish our Market Day Bag, and I am very excited about that project...I am not sure what is next. Second, the best part about all of this is that I found several charities that request knitted items for babies, as well as scarves, hats, mittens, sweaters, etc. 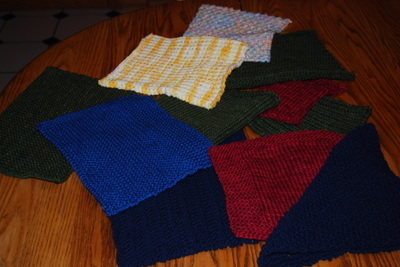 for young children, and I am really LOVING that I could knit things to donate...that appeals to me immensely, so that is definitely where all this is taking me in this knitting venture. And, third, and last, I have to say this knitting thing is just great. For my birthday from Matt and Alex I got the Denise travel knitting needle kit and a Denise organizer, so I can take this knitting jones on the road at any moment...whenever I am sitting and waiting for these guys, I can knit...you can do it most anywhere. I just love that. And, of course, the first thing everyone says is, "I didn't know you could knit. I have never once pictured you knitting." Followed closely by, "Okay, what gives...where is your book?" More than one reference has been made to the possibility of the "real me" having been replaced by a "pod person"....I wonder...hmmmm...maybe. 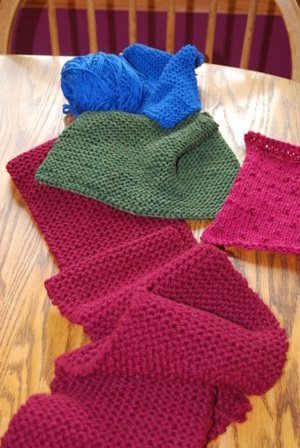 Last week I practiced different knitting stitches for various weights of yarn, etc. on dishcloths...very useful indeed. The Navy, Wine, and Green ones are staying here. The others have homes already. 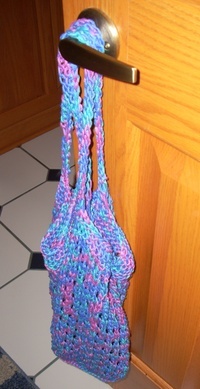 Oh, I just love this knitting thing...it is so portable! Whenever I need to wait, I can knit if people are around that want to chat, and I can read if there are not people around wanting to chat. What a deal! Several blogs I check in on now and again are crafting blogs, i.e. quilting, knitting, crocheting, jewelry making, pottery, etc., and occasionally the owners of the blogs will sponsor a "swap," i.e. 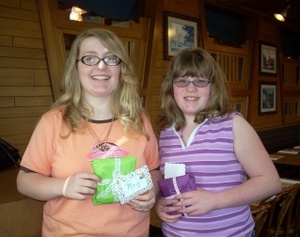 several of them agree to make things and then swap with each other, each receiving something special and unique from the others, and at other times, they do a "giveaway," which is usually in the form of some sort of drawing, the recipient of the draw being sent something that the owner makes. So, what am I giving away? Why, a new, hand-knitted dishcloth, of course...STOP LAUGHING. Here's how it works: if you would like to have this lovely piece of goodness, destined NOT to become a collector's item or anything valuable, but rather destined for certain demise in a certain amount of months of a certain amount of hard use, then all you need to do to put yourself in the running is to send me an email saying such, including the colors in your kitchen. I then put all the names into some sort of hat or bowl or something along those lines, and draw from it one perfect name. After that, it is just a matter of time before the postman brings it in his wagon and deposits a package at your door/mailbox, and you open it and shout with glee, "Hey, I won something!" There is no age requirement (alas, kids, something for which you DON"T have to be at least 18). I will collect email names from this Tuesday's craft blog until this coming Monday and announce on next Tuesday's craft blog the winner of said wonderfully constructed original hand-knitted dishcloth of custom design. Bet you just can't wait, right? So, what are you waiting for...send an email to me and put in the subject line: "Blog Contest" or some such thing so I won't think you are just SPAM. If this turns out to be fun, there may be something even more exciting down the line...like mittens or a market day bag! Made by me...who knew??? Well, here it is CRAFT DAY at GKT and I have some things to actually show. Stop laughing. Right now. Our knitting class was Thursday (I finally made it to a knitting class). The photo shows what I have managed to eke out in the past four days (be kind as I have never done this before). So, what is next in the knitting realm? Jan and I have a little list of practical things that the instructor says is manageable as we move along...things I have seen on other blogs and in the examples they have around the shop which are on display: dishcloths for pattern practice, scarves, mittens, maybe a hat (Matt wants some warm stocking hats for the winter to wear to and from the pool in the cold), market day bags, golf club head covers, a felted purse, socks, maybe eventually vests/sweaters...possibly an throw (although we have many of those from relatives who so lovingly provided us with such over the years)...and then, maybe I can make some baby/little kid things. So, that's the list...enough to keep me busy for a good long while and then some. And, lastly to answer your questions about why I am feeling compelled to knit, etc. The answer is fairly simple: I want something to do while I am waiting around for the boys at various activities, especially Matt with the swimming and choir rehearsal gigs which go on for hours and hours at a time. In years past, I had plenty to keep me busy as I was homeschooling the boys and would write/adjust curriculum, plan lessons, write tests, grade papers, record grades, etc., to send in to Seton Homeschool. There was always plenty to keep me occupied. Now, not so much. The knitting, etc. seemed like something that would keep me occupied and also be something useful. (I don't sit still well without something to keep me occupied.) So far, I like it...and I always like learning something new. So, stop laughing. Right. Now. Can't wait to see what you all post this week!